For some people keeping up appearances and building a social reputation is both important and validating. This isn’t something that is only tied to extroversion or introversion, since there is much more to it than just that. For some it is rewarding to build a social presence, for others this seems exhausting and completely fruitless. 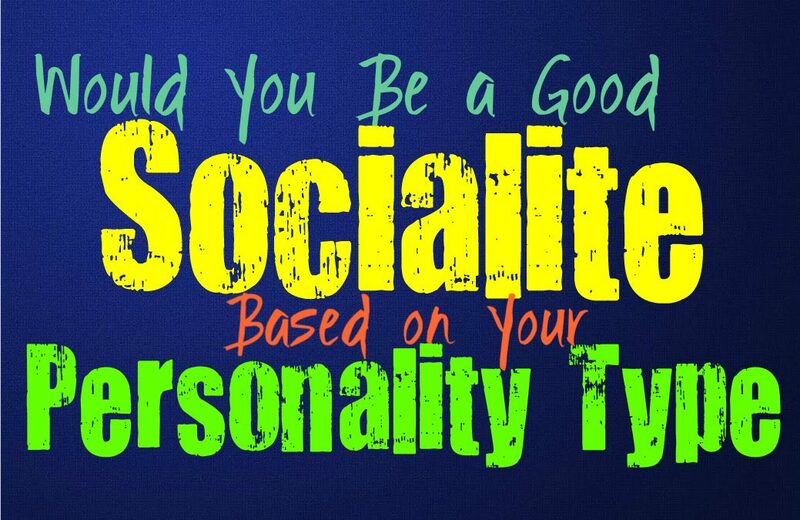 Here is how you feel about being a socialite, based on your personality type. There might be some INFJs who find themselves fitting into the socialite world, but this is often because they grew up surrounded by it. For most INFJs this feels emotional exhausting, more because of how meaningless it often feels to them. It isn’t entirely about the social interaction, which can be draining as well, but more about how insincere it can feel. At the same time some INFJs might find themselves being a socialite on the internet, since it gives them that sense of validation and interaction, while still maintaining proper distance and alone time. For those INFJs it can be rewarding for a short time, but they will eventually lose interest. ENFJs can often make for great scoalites, since they are outgoing people who understand how to respond to others. They are good at juggling these types of social obligations and often know how to maintain their social and business life. They often know how to operate the social world almost like a job in some ways, and are good at figuring out what other people need and expect from them. Many ENFJs can fit into the world of being a socialite rather naturally, although it might not be a fulfilling lifestyle long-term. Most INFPs are unlikely to find appear in the socialite lifestyle, mostly because it can feel meaningless for them. Many people see the INFP as shy people simply because they are introverts, and this is often very untrue. INFPs can be charming and outgoing, and are often excellent performers because of their inner creativity. Since INFPs are good at being in the spotlight, they might actually make for excellent socialites. For them it isn’t about being incapable of it, it is about feeling drained by the environment and wanting something much deeper. ENFPs are very outgoing and social people who enjoy being center of attention sometimes. When they are younger the ENFP might consider themselves a socialite, and will enjoy going out and keeping up with their social obligations. The young ENFP can battle with their desire to be liked by others, and will want to live up to these expectations. As they get older they will often feel much less inclined to keep up with this socialite lifestyle, and will likely find themselves searching for something more internally fulfilling. Most INTJs are not drawn to social situations, nor do they find themselves wanting to become a socialite. For INTJs the idea of having to live up to social obligations often sounds very appealing. The only circumstances where the INTJ might find themselves fitting into the socialite world, is where they might take it as a challenge or world to be conquered. This might be something they dip into when they are younger, but it really isn’t something that fits their personal goals or needs. For most INTJs this feels both shallow and immensely exhausting, especially feeling obligated to keep up with it. ENTJs can often be good in the socialite world, but they can become a bit bored with it after a while. If they feel like this lifestyle can propel their careers and help them achieve their goals, then they will certainly take advantage of it. ENTJs are outgoing people who can often fit into the social world fairly well, especially when they feel like it is a competition in some ways. ENTJs often push themselves to achieve things in life, and seek to be the best at just about anything they do. For INTPs the idea of being a socialite is often one of the most appealing things they could imagine. This doesn’t mean INTPs cannot be outgoing, and they often do fit into social situations just fine. INTPs simply don’t enjoy feeling obligated to their social lives, like it is a job or something they are forced to maintain. INTPs would rather make sincere connections with people, and will likely become bored or even drained if they feel like their social lives are an obligation they need to uphold. ENTPs are charming and outgoing people, and so they are often capable of upholding a socialite lifestyle. They have a knack for making people laugh and can often get along with just about anyone if they want to. For ENTPs being a social person isn’t something they struggle with, but at the same time they aren’t rule followers. Feeling forced to constantly interacting in certain ways and uphold their obligations socially, can feel a bit exhausting and very unfulfilling for the ENTP. ISTJs are often capable of upholding certain social obligations, mostly because they follow the expectations of society. ISTJs do their best to maintain their business and social lives, but they do become drained with too much interaction. ISTJs might make for good socialites if they can find the balance between time alone and time with friends and at social events. The ISTJ who grew up in this lifestyle can actually be great at upholding it, since they have grown accustomed to it. ESTJs can make for great socialites, especially if they have grown up in this world. If they have grown up in the socialite setting, they will fit into it fairly well. ESTJs are good at things when they learn the ins and outs and can often adapt accordingly. For them it is easy to be a good socialite, especially if they feel like it is a competition in some ways. They work hard to make their family proud and to live up to their expectations, whatever those may be. ISFJs are often good at things when they have adjusted to them or have grown up in that environment. They are capable of being social and outgoing people, especially if this is what is expected of them. ISFJs can make for excellent socialites, especially since they are friendly and often outgoing people. They can make themselves fit into this world fairly easily, especially if it is something they grew up around and understand well. ESFJs are often viewed as natural socialites, since they are outgoing and friendly people. They enjoy being around others and are good at catering to their needs. While ESFJs might fit into the socialite world fairly well, it is often something that lack fulfillment for them. They might adhere to this lifestyle when they are younger, but find themselves growing bored of it. In truth ESFJs are more family-oriented people, and so the socialite lifestyle might be draining after a while. ISTPs aren’t often seen as the socialite type, simply because they become so drained in these types of settings. Feeling obligated to uphold their social life is something that most ISTPs will not feel rewarded by. They prefer time to themselves and rarely do they want to feel like they need to adhere to certain social rules. For the ISTP being a socialite is both draining and complete unappealing. ESTPs are very outgoing people who do sometimes enjoy the socialite lifestyle. They are good at connecting with people when they want to, especially in a laid-back setting. ESTPs are often capable of keeping up with these appearances and can be capable of upholding their social life with a sense of direction and excitement. They enjoy being able to experience the challenges and thrills of an active social life, but they might become bored with it after a while. ISFPs are often very internalized people who can become drained with too much social interaction. At the same time they are friendly and enjoy making connections, so they might be good at being socialites. Depending on the environment and if it fits into their personal style, ISFPs can be both fashionable and trendy people. They know how to keep up with their social calendar, even if after a while this feels a bit vapid to them. ESFPs are often excellent socialites, since they are outgoing, charming and friendly people. They enjoy being liked by others and often want to seek out new social events and occasions. They are good at keeping up with their social calendar and rarely do they become drained by constant interaction with others. ESFPs find themselves capable of balancing their active social lives and often feel rewarded by this way of living.